The Golestan Palace is part of a group of buildings that were once part of the Tehran citadel (known as Arg), built in the 16th century. When Agha Mohamd Khan Qajar chose Tehran as the capital of his kingdom in the 18th century, he made the Golestan palace the official residence of the royal family. 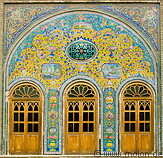 The Golestan palace underwent a number of restaurations and modifications and is nowadays an art museum. Since most historic buildings in Tehran were destroyed under the reign of Mohammad Reza Pahlavi, the Golestan palace is one of the few remaining old buildings in Tehran.